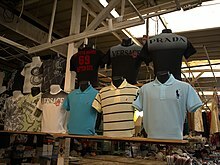 Counterfeit is the sale or manufacture of items that have not been made by real companies or have been made illegally. Nearly anything can be counterfeit, but most counterfeiting is of clothing and other small items such as bags, medicines, money, watches, or jewellery. Most things can be sold without people realizing that they are counterfeit and that they could possibly be breaking the law by buying the counterfeit goods. Money can also be counterfeited. Sometimes people make fake cash, and this is considered to be counterfeit. The United States Secret Service investigates people who do this. ↑ "Detecting the Truth; Fakes, Forgeries, and Trickery". This page was last changed on 29 December 2016, at 20:38.